"We are merging science with art, adding that extra 'A' to STEM (Science, Technology, Engineering, Math) education to make it 'STEAM' education," says Physics Professor Jeremy Qualls, who is working with Physics and Astronomy Chair Lynn Cominsky and others on the project. With free workshops set to begin next semester and a class utilizing the space beginning in fall 2017, Qualls hopes the Makerspace will inspire and empower the Sonoma State community to turn ideas for products and inventions into real, functional prototypes. "A student can design and 3D-print a board game in the Makerspace in the library, and then sell it at the Made By Seawolves store in the Student Center," says Qualls. "They can make a piece for their skateboard, or even design and make one from scratch. The space is full of infinite possibilities." The $584,705 grant brings tools like 3D printers, a computer controlled mill, laser cutters and micro controllers, as well as materials like electronics, cloth, fabric, leather and more to campus. It is projected to be open by January on the second floor of the library. "You can make the same things you could in a machine shop, and more, and it's easier and safer to do," says Qualls. "This Makerspace will have everything you need to create." The grant also pays for the development of Science 220: Dream, Make, and Innovate. The course offers GE credit and will be offered beginning in fall 2017. The new Maker program encourages cross-campus academic partnerships for students to explore their own creativity, regardless of major. "We want students to know that whether their major is engineering science, business, psychology, communications or anything else, they are encouraged to come create and build with us," says Qualls. 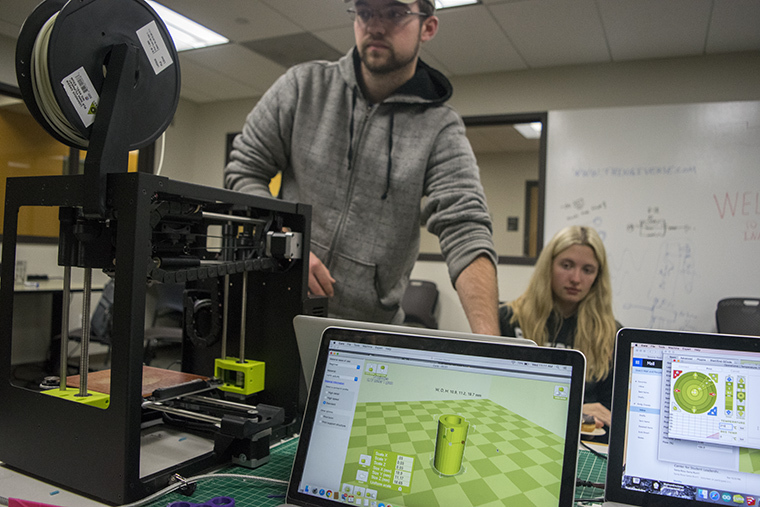 Sonoma State is one of five California State University campuses with a Makerspace. Qualls believes SSU is taking a big step in creating future Makers. "I think making is one of the most significant changes in my generation. It's allowed technology to affect not only what we can make in the lab but how we think and how we can solve problems," he says. "The Maker Movement is internalizing how we see ourselves and how we build things from the inside out," says Qualls. "A lot of people who don't ever take sciences, or are bad at math, they feel intimidated by someone else's skill set. The mindset is, 'There's something wrong with my car, I'll just take it to the mechanic.' I think that a lot of that can be overcome with this kind of environment where anyone is able to design and make things on their own." Along with being able to use other workshops in the art department, the Sonoma State University Makerspace is collaborating with 180 Studios, a new Makerspace being built on Todd Road in Santa Rosa, allowing students to use both spaces for more advanced projects. "We want Sonoma State to be a big part of the existing Maker community and work as a hub for the community," says Qualls. Lynn Stauffer, dean of the School of Science and Technology at Sonoma State University, has been selected as a recipient of INSIGHT into Diversity magazine's 2017 Inspiring Leaders in STEM award.